Apparently, Devin Oliver, "I See Star's" lead vocalist, is very likely to play a part in the next season of "Game of Thrones". Be careful: spoilers on Game of Thrones season 7 will follow! GOT fans always dreamt of seeing the fascinating Rhaegar Targaryen featured in the show, and now the time has apparently come: look at what Devin Oliver recently posted on Instagram! Oliver's presence in "GOT season 7" was hinted by Devin Oliver himself on Instagram: "I may or may not have made an appearance in Game Of Thrones season 7," wrote the singer posting a photo in which he appears with long blond hair and a bow in his hands. Tons of fans immediately answered claiming that he's totally going to portray Rhaegar Targaryen in GOT's next season. Shortly after, the debate inflamed on Reddit as well and a lot of fans agreed on the role he's most likely to portray: the role of Prince Rhaegar, Lyanna Stark's lover and Jon Snow's father. Rhaegar was the eldest son of the Mad King Aerys II. As heir-apparent, he was the Prince of Dragonstone and crown prince for the Iron Throne. Very popular with the smallfolk, he died during the Battle of the Trident killed by Robert Baratheon. Rhaegar's taking of Ned Stark's sister Lyanna is one of the main reason of Robert's Rebellion: as we all saw in "Game of Thrones" season 6, he is also the father of Lyanna's son, Jon Snow. His wife Elia Martell and his children were killed during the Sack of King's Landing. Devin Oliver looks a lot like Rhaegar: he's fascinating, with sharp lineaments, a slim figure and a good voice. Since Prince Rhaegar was a singer and a poet, not only a swordsman (according to many, he "loved his harp more than he loved his lance,") it makes perfect sense for him to be portrayed by a singer. 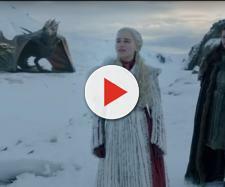 Is he going to sing the Song of Ice and Fire during a flashback in "Game of Thrones" season 7? Only time will tell!